LIFELINE ANIMAL PROJECT INVITES YOU TO CELEBRATE A HEALTHIER NEW YEAR BY ADOPTING A PET FOR ONLY $16 DURING JANUARY! 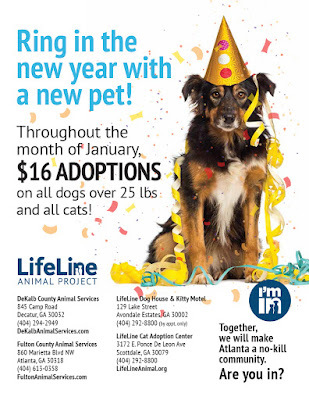 ATLANTA, GA -- (December 31, 2015) LifeLine Animal Project, the nonprofit which has pledged to have its county shelters obtain historical no-kill levels by the end of 2016, invites you to keep your New Year’s resolution to be healthier by adopting a new pet for only $16! During the month of January, adopters may choose any dog over 25 lbs. or any cat for only $16, including the pet’s spay/neuter, microchip and vaccines – a $250 value! All of LifeLine’s shelters are participating in the $16 adoption promotion, including: DeKalb County Animal Services (DCAS), Fulton County Animal Services (FCAS), LifeLine’s Dog House & Kitty Motel and LifeLine’s Cat Adoption Center.